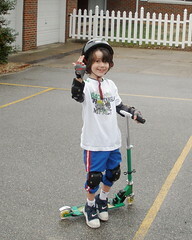 Look out Tony Hawk, Jake is ready for his X Games debut! I noticed that you directly quote the first three sentences of my book Wabi-Sabi: for Artists, Designers, Poets & Philosophers in your "What is Wabi-Sabi" section. I'm flattered. I would appreciate it if you also used quotation marks and mentioned that the quote is from my book. My apologies for not citing your quotation appropriately. I have seen this language in many places online. I'm sorry to neglect attributing it to you. As you can see, I have added a link to your website following the quote.